Look this list over folks – it’s the best variety of exhibitors, boats, products and services ever at the Oriental Show. Interested in being part of The Best Small Town Boat Show in America? Contact show organizer Sam Myers 252-249-0228 or via email, director@orientalboatshow.com. The show’s Flagship Sponsors are in green – Commodore Sponsors in blue – and our other great sponsors in red Sponsor web addresses are a direct link to to their sites. Jim Capps, CappsTrailers.com; wonder if that rotten trailer will get your boat to the ramp again? Jim can cure that worry, plus show you some nice utilities & dumps too. Marsha Paplham, marshascottage.com; great styles & versatile fashions for every occasion, just 2 blocks from the show at 204 Wall Street. 252-249-1515; the County’s news source & newspaper of record since 1968. Tonya Smith, healthyfurbaby.com; shouldn’t your pets enjoy tasty but wholesome goodies just like you? Pete Waterson, SeacoastMarineElectronics.com; your preference in state-of-the-are marine electronics like Raymarine, Simrad, ICOM, Garmin, etc. Their attention to detail sets them apart. Captain Tyler Vanhoy, 252-342-2802; wonder why we call Pamlico County & the Sound “NC’s In-shore Fishing Capitol”? Captain Tyler can show you. Jeff Mooring, trent.com; showing a whole fleet of stylish & economical vehicles; everything you need to tow or travel. 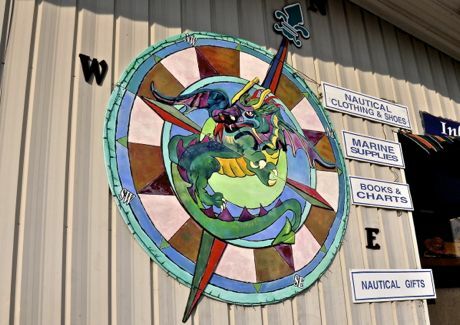 Tom McCary, 252-249-0200, wayfarerscovemarina.com – a full-service marina at one of Pamlico’s best “hurricane holes” and yard with all maritime repair specialties on site. Captain Jim Holley, worldwidemarinetraining.com; USCG-approved Captain’s courses all the way to 200 tons. Also raffling a full Captain’s course at their booth.